Traditionally regarded as taboo for its association with hippies and drifters, today backpacking is a popular form of travel among people of all ages. Easily one of the most economical and independent means of traveling, backpacking is not only a widespread hobby, but a lifestyle. 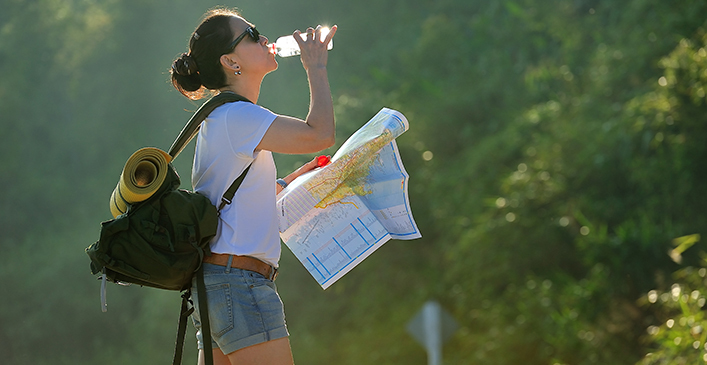 Whether you’re a seasoned backpacker, or just starting out, read on for some essential tips. When you’re in the midst of an adventure your normal healthy routines might start to slip as you find yourself eating your second fast-food meal of the day, running low on sleep, or finding bigger blisters on your foot than you had bargained for. While it’s easy to get caught up in the thrill of your traveling, prioritizing your health is a must for all backpackers. Make sure to get enough sleep, stay hydrated, and tend to any small cuts or blisters immediately. When you’re on the road staying healthy is in everyone’s best interest.